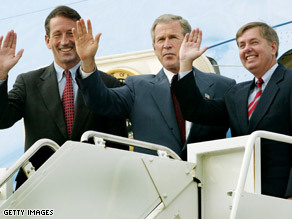 President Bush with Sanford, left, and Graham, right. (CNN) - In an interview Wednesday, one of John McCain’s top backers, Sen. Lindsey Graham of South Carolina, appeared to pour cold water on the notion that his home state’s governor, Mark Sanford, would be a strong addition to the Republican presidential ticket. Sanford, a fiscal hawk from the Charleston area with solid credentials on social issues, has seen his name floated by national political observers as a possible running mate for McCain. But within South Carolina, Sanford has maintained a rocky relationship with Republican legislators over spending and reform issues. Speaking with reporters and editors from The State newspaper in Columbia, Graham praised Sanford as a "solid conservative reformer" and said of the 47-year old governor, "I think his profile nationally among conservatives is very positive." However, Graham noted that Sanford has had a "tough" tenure as governor, and argued that adding a South Carolinian to the Republican ticket would have a meaningless electoral impact. "To be honest with you," said Graham, "I don't see any of us in South Carolina bringing a whole lot of value to the ticket. We're talking about winning a national race that's going to be very competitive." Sanford did not endorse McCain or any GOP candidate before the South Carolina primary, but he has since backed the presumptive nominee. "When it comes time to pick a vice president, that the smart money, I think, would be trying to add to the national security, you know, reinforce that aspect of the ticket," Graham said. Speculating on what could happen in his state this fall, Graham said he considered South Carolina too conservative to turn blue in the general election, but still predicted Barack Obama had the potential to shift the electoral map. "Sen. Obama would create energy and enthusiasm, particularly among African-Americans, so there he is ... some states would be in play that hadn't been in play before," he said. Hillary is auditioning to be his running mate... why not choose her?? Jeezo! Those two sound more like they're getting a divorce than running for the Democratic candidate. They both should quit slamming each other & stick to what they will do if nominated. McCain has a great econemic plan. People needs to be responsible for their own act. If they borrow money, they should pay back. Just walk out the house you brought and let banks go under, that is not fair to banks. But it is not government's responsibility to save those inresponsible acts. John McCain could nominate Krusty The Klown as his running mate. It wouldn't make any difference – he's gonna lose come November. These moronic [R]s keep caling themselves "conservative". Talk about big-brother doublespeak! They have consistently supported the reactionary and liberal policies of the Bush administration and the discredited [R] congress on both the domestic and foreign fronts! Yeh, that's real conservative there, Elmer Fudd. Looks like you have chosen McBevis for your candidate; why not go for Butthead for VP candidate. Unfortunately that does not narrow down the field for you. The only way McCain's running mate will matter is if he chooses a Democrat! the man cannot win in November...if he even can remember his name by then. After hearing so many Republicans point fingers at the mortgage crisis and calling people irresponsible, when the companies are also to blame and MANY homeowners have lost jobs, had medical crises, etc. the Repubs act "above it all"...I doubt McCain will win no matter who is the Dem nominee. Oh wait, Hillary will turn people away in droves! That's the only way McCain might win...with Hillary as an opponent. Watch him choose Joe Lieberman. Pelosi is right. Richardson and Kennedy should retract their support for Obama and vote for Hillary. McCain needs a running mate that is known for his economic policies. That is the Republicans weakness. "Sen. Obama would create energy and enthusiasm, particularly among African-Americans, so there he is … some states would be in play that hadn't been in play before," he said. INTERESTING TO NOTE THAT REPUBLICANS ARE CONCERNED ABOUT OBAMA PUTTING SOME STATES INTO PLAY..........GUESS THEIR ATTEMPTS TO GET HILLARY (as a slam-dunk loser) ISN'T GOING TO WORK. Mark Sanford would be an excellent VP. now you know why Rush created operation Chaos, having Republicans register to vote in the democrate primaries for Clinton. It worked in Texas except in the caucus where Republicans didn't show up where they gave Clinton 160,000 plus votes and in Ohio where over a 100,000 Rep voted for Clinton and even in Mississippi where over 50,000 voted for Clinton and in PA almost a half million Rep have just registered to vote in the Dem primary and in NC and IN,SD and WY. Wow who could have imagined the effect this would have on the Democrate party and now McCain is up by 10% and the margin will surley grow as the Dem fight continues.. WHERE IS YOUR REPORTING ON THIS MOVEMENT BY TALK RADIO LED BY RUSH LIMBAUGH? WHY BACK ANY CANADATE WHEN CLINTON MAINTAINS EVERY DELEGATE PLEDGED OR SUPER CAN DO WHAT EVER AND THE CONVENTION HACKS WILL RULE NO MATTER WHAT? When this is over the DEM PARTY WILL BE IN CHAOS FOR YEARS> WHO WOULD HAVE GUESSED ONLY A FEW WEEKS AGO? ITS TRULY AMAZING. himself from you, yesterday. A Republican is against citizen's rights!!!! McCain's policies are outdated and he has nothing to offer to anyone. American public never vote for Republicans again. CNN staff may vote for him.